A free responsive HTML5 app landing page template. 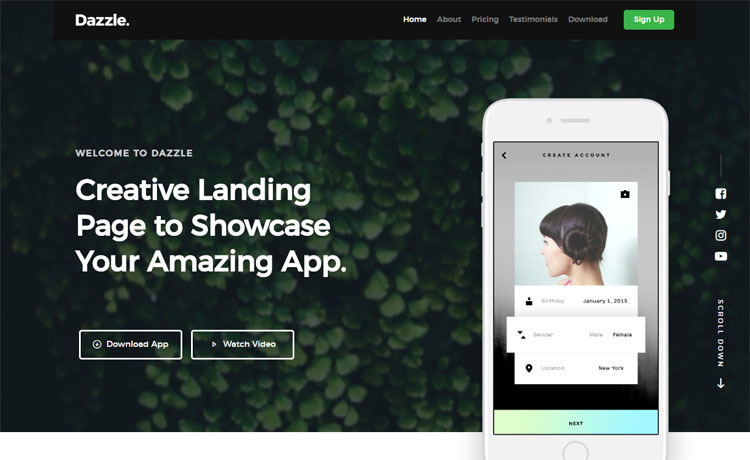 Dazzle is a beautifully created free responsive HTML5 app landing page template to showcase software and mobile applications. It has clean codes, which made it easy to customize. Dazzle has a minimal, stylish design and one-page layout. Besides, Dazzle is retina-ready which makes it eye-catching. It is a perfect tool for mobile apps, email apps, personal portfolio, creative agency website template. Dazzle is packed with latest assets and features like hero header, model Vimeo video player, parallax background, sticky navigation. Moreover, Dazzle has a working newsletter subscription widget in the box. Single style page with 15+ unique UI block elements. whatever you need, Dazzle has it all packed in the bundle. Go, Create, Enjoy! Thank you for downloading Dazzle. Here are three recommended free responsive HTML5 app landing page templates.